For reservations call on 08750582297 or +91 95602 65223. Join us for a spectacular Saturday night with a band from Darjeeling, Feeling'Go! The band plays a mix of originals, Motown, Blues and their arrangement of popular music with a great affinity and inclination towards improvisation. The members of the band are some of the most well-known musicians of their generation and were former members of critically acclaimed bands viz Rusty Nails, J Hola. HEMRAJ CHETTRI is a drummer, vocalist and composer from Darjeeling, India. Hemraj has been involved with many bands since 25 years of which one of the most popular band being, “Rusty Nails”, have performed in various festivals and venues extensively in India and Nepal. He was the Drum faculty at the prestigious Kathmandu Jazz Conservatory for over a decade. YOUGAL BASNET is a Guitarist and composer from Darjeeling India. Yougal is one of the most sublime and sought out guitar player and for which he is the first call guitarist and has been involved with most of the bands from Darjeeling since the early 90s viz Third Eye, Leviathan, Rusty Nails, Damage Brain. Since then, he has always been involved with various productions in and around Darjeeling and Kathmandu. A longtime associate of the band “The Rusty Nails “, he has always been an inspiration to many. ASWATH RUMBA is a composer, bassist and writer from Darjeeling, India. He started his music studies in Classical guitar while he was in school. He was part of the band “Pralaya “who were rated as one of the best bands in India. They along with Pentagram were always the highlight of band competitions across India in the early 90s. 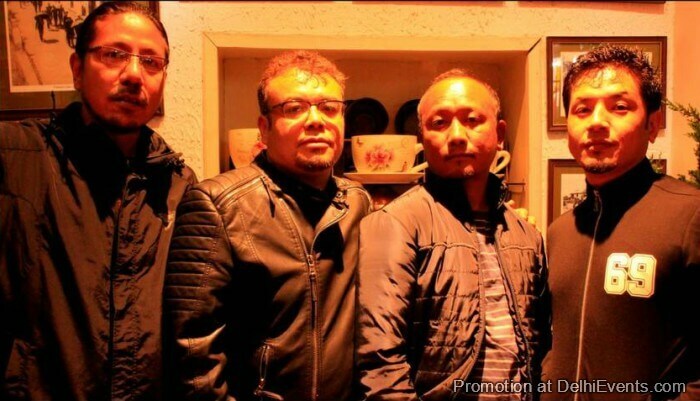 After his successful stints with Pralaya , The Mahatmas and various other bands, Aswath formed J-hola a jazz quartet who played regularly at Shangrila Jazz bar, Moksh bar and Jazz upstairs in Kathmandu Nepal. They played at the prestigious Kathmandu Jazz Festival and Miss Nepal 2003. J-hola went on to release their first Nepali pop jazz album which was well received and is considered to be one of the best album ever produced. He continues his work in music now in Darjeeling with Feeling’Go and works closely with other young musicians sharing his knowledge and passion.